What I always wanted to try out on tomorrowland where the restaurants. But mostly the restaurants where sold out before you knew it or they didn’t have a veggie option. But because there are more and more restaurants at tomorrowland you have more chance to book one! Brasa was not my first choice because of course I wanted to book the restaurant with a beautiful view over the main stage, but this is sold out as fast as the tomorrowland tickets or even faster! 😉 But brasa was my second and last choice that had a veggie option. 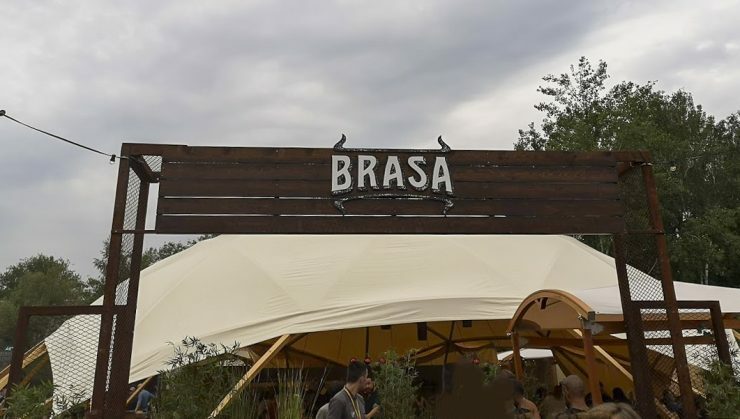 And because brasa is new on tomorrowland I thought it would be a good idea to write a review about it! What do you get for €32: MEATizer (a small appetizer), the main course, a bottle of water (1,5l) and a glass of wine or beer. I booked the brasa experience online and I also payed online. You had to choice witch menu you wanted, meat, fish or veggie (choice wisely because you can’t change this). And then you had to choice the day and the hour. On the booked day and hour you could then enter brasa. We booked this on Friday at 17h15. And this was the perfect hour because we had enough choice where we would take a seat. So to make it easy let’s say that a similar menu on tomorrowland is 20 pearls and that is €32, so that is the same price as from this menu. This price is for sure correct and I only can recommend this! The food on tomorrowland itself is also good and very varied. Buuut eating in such a restaurant is of course another experience. Because in a restaurant you can eat with real servers and you can eat it relaxed. So I can recommend that you need to try out this or another restaurant! I choose the vegetarian option, the burrata. Because this would be smoked I had expected that it would be hot. But this wasn’t the case because it was a cold dish. The burrata tasted perfect and the smoked gave this something extra. The taste was perfect when you combined the burrata with the vegetables and the sauce, this was a magnificent combination! The ‘bread’ that you get with this was also a perfect combination! It’s for sure a very good and original dish! I had the veggie menu, but the appetizer was with meat. It was a bummer that the appetizer was only with meat. I also find it a bit of a disadvantage that you first got a beer or glass of wine. Of course is this not so bad, but you always have people that don’t drink alcohol. Or people like me that drink on an empty tummy (stupid) and then it goes to your head. But I appreciated it if they had an option for a soda. It was well organized! We got or glass of beer or wine, and then the meat appetizer very quickly. And after 10 till 15 min the main course that you choice followed, and they also brought the bottle of water. The service was very quick and friendly! Brasa is also located on a beautiful location with a stunning view! The food is good and the combinations are unique! The portions are not that big, they are enough if you have a normal hunger. Brasa is a lovely and cosy place to eat! When you see my happy face, you see that it was for sure worth it and the view was mind blowing! On tomorrowland you have more restaurants, even one with a view on the main stage, but this one is always sold out in no time. And because that was sold out I choice to book brasa. Mainly because I also wasn’t sure or the other restaurants had a veggie option. But you have more restaurants with different experiences like a live dj that is playing. So booking a restaurant on time is for sure worth it if you go to tomorowland! This place looks amazing and food looks so yummy! Yes, it was way to good!